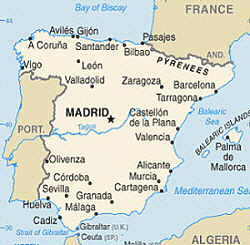 Castellon de la Plana is the northernmost of the provinces of Valencia bordered in the east by the shores of the Mediterranean. The climate is temperate with little rainfall. The special feature of its rugged interior is the great tableland of the Maestrazgo and the giant pyramid of Peñagolosa. 120km of coastline consist of a number of beaches of sand and rocky sectors which are the most characteristic feature of the Castellón coast. To the north Castellón has the very beautiful peninsula of Peñiscola, once the residence of Papa Lune. Very popular with the visitor is Peniscola, Burriana, Benicasim, Oropesa, etc. which lie on the coast with lovely beaches forming part of the orange blossom coast. Popular towns are Morella, Lucena del Cid, Segorbe and Alcora. Castellon is rich in orange groves, orchards, vineyards and olive groves, and the capital itself Alcora, Ribensalbes and Onda are chiefly known for their tile and general pottery industry. The most popular fiestas are those of La Magdalena and associated with the pilgrimage to the Cerro de la Ermita. Castellón lies close to the sea and is a thriving modern centre with fine buildings such as the Town Hall, the Bell Tower, the Cathedral of Santa Maria which has been rebuilt and the Church of San Agustin. Cuisine includes excellent fish dishes, first class shellfish, giant prawns, field mushrooms, cured beef and cottage cheese. The city was re-conquered (1233) from the Moors by James I of Aragon. In 1251 it was moved 2 mi (3.2 km) from a hilltop to its present site on a plain (hence “de la Plana”). With the arrival of Spring, Castellón de la Plana begins its celebrations with a festival in honour of Santa María Magdalena. A religious procession called the Pregó is held on the third Saturday of Lent, providing an occasion for both the local population and visitors to participate in festivities in the streets. The townsfolk then take part in the Romeria de les Canyes, one of the many traditional pilgrimages held throughout the province. The pilgrims carry canes topped with green ribbons and head towards the Hermitage of the Magdalena, the site of the ancient town. After a traditional religious ceremony, a number of popular activities are staged in a highly festive atmosphere. This is followed by a week of festivities, entertainment, concerts, fireworks and many other activities, including an offering of flowers to the Virgin of Lledó and the Processó de les Gaiates,a celebration in which each barrio of the city, with its queen and her court of honour, parade through the streets accompanying the Gaiata, a float that symbolizes the origin of the city. To participate in the action, the places to go are the Casetas (the meeting-places for each participating group), the Mesón del Vino (wine house) and the Crafts and Alterative Lifestyles Fair. In addition to these, other important feasts include the Patron Saint Fiesta honouring Santa Maria del Lledó on the first Sunday of May and Saint Pere Apostol.